Ahead of the historic summit between United States President Donald Trump and North Korean leader Kim Jong-un on Tuesday, a coalition of human rights organizations from around the world sent a letter to the communist leader, urging him to undertake “meaningful reforms” to reverse the grave human rights situation in the country. Trump and Kim are due to hold talks -- the first-ever between a sitting US president and a North Korean leader -- in Singapore, with Trump describing the summit as a “one-time shot” at peace. Denuclearizing Pyongyang will top the agenda, while bringing a formal end to the 1950-53 Korean War will also be on the table. Whether the issue of improving North Korea’s human rights situation will be discussed remains to be seen. “As the UN Security Council has recognized, human rights abuses in North Korea and threats to international peace and security are intrinsically connected, so any security discussion needs to include human rights,” said Brad Adams, Asia director at Human Rights Watch, on behalf of some 300 nongovernmental organizations, on Thursday. The letter was signed by 52 organizations, including coalitions representing more than 300 nongovernmental organizations from Asia, Latin America, Africa, Europe and North America. It urged Kim to follow through with United Nations’ recommendations on human rights; increase engagement with the international human rights system; respond to and take action on the findings of the seminal 2014 UN Commission of Inquiry; end abuses in detention and prisons, including forced labor; allow regular meetings of separated families of any foreign national with relatives in North Korea; and accept international humanitarian aid with appropriate monitoring to ensure it reaches needy people and communities. In North Korea, the state has tyrannical, monolithic control over every aspect of the society; the country ranks at the bottom of the World Press Freedom Index, according to Reporters Without Borders; and freedom of religion is nonexistent, except being technically enshrined in its constitution. Some 200,000 North Korean children suffer from acute malnutrition, of which 60,000 are “severely malnourished,” reported UNICEF. There are between 80,000 and 120,000 people in prison in the North, the US State Department estimates. People can be incarcerated for anything, activists say, with purported crimes ranging from watching a South Korean movie to attempting to defect. Political prisoners in particular face some of the harshest punishments at infamous labor camps, or gulags, where they are forced to engage in hard physical labor such as mining and logging. They are also often beaten and tortured by prison guards. Women are sexually abused and raped. The US State Department also stressed the link between the North’s nuclear program and human rights abuses. Nikki Haley, the US ambassador to the UN, agreed. Trump said in a press briefing at the White House on Friday that he will raise the issue of human rights when he meets Kim. “No regime has oppressed its own citizens more totally or brutally than the cruel dictatorship in North Korea,” he said at this year’s State of the Union, where he introduced defector Ji Seong-ho, who escaped North Korea after suffering severe injuries. Last year’s tragic death of American university student Otto Warmbier has served as another reminder of the grim plight of prisoners inside the totalitarian state. 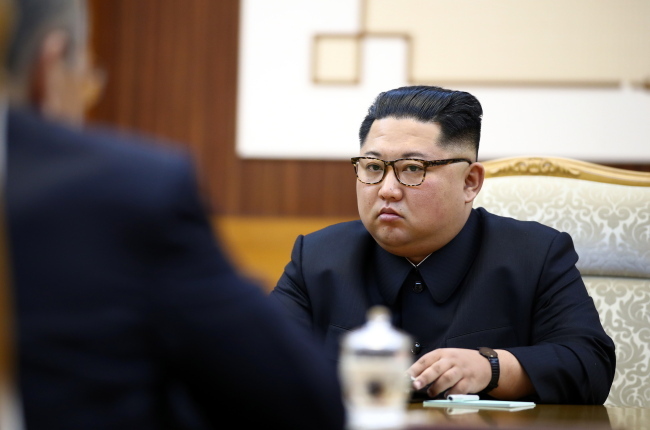 Kim, meanwhile, pledged to improve inter-Korean relations -- as declared in the April 2018 Panmunjeom Declaration -- by encouraging cooperation and exchanges between civil society organizations; resolving the humanitarian issues that resulted from the division of the nation; and promoting balanced economic growth.